There will be a registration & info desk open at the conference hotel on Sunday, March 04 from 14:15-16:00 pm and from 14:15-18:30 pm in the exhibition area at the conference site where at 18:30 pm the welcoming reception starts. During the breakfast on Monday and Tuesday a registration & info desk will be open right in the breakfast area. All pre-registered delegates may pick up their badge, ticket and conference-guide right there. In any other case, please try to be at the OZ-18 site before 09:30 am (e.g. catch the first bus from the hotel) so that all can be set before the symposium starts. There you may register on site. Please expect a very casual and insofar very cool welcome reception right in the exhibition area on Sunday evening. That may give exhibitors the chance to finish the last details of their set-up under zero stress already on Sunday. Oral presentations are scheduled for 20 min plus 5 min discussion. All presentations shall be given in power point and you are requested to give your presentation on a USB-memory or CD identified by your name and presentation number (Vxx) to the OZ organizers as early as possible and in the latest by 09:45 am on the day of your presentation. We do have the computer, the beamer, the pointer and the cordless PP-control available for you. Since the exhibition area is right in front of the conference auditorium, please help us to arrange a good meeting on time by strictly obeying the published exhibition set-up and turn-down times. On site you will always find helping hands and in case you need us to supply a table and one or two chairs, please just let us know at OZ-organization. All these services are free of charge of course. We will have electricity available for simple illumination. In case you want to operate some equipment, please contact us at OZ-organization. Power supply then might not be free of charge. If possible, please bring your own extension cords for about 20 meters in case you want to use some illumination at your booth. In case you want to exhibit vehicles outside, the plaza in front of the townhouse is available upon inquiry at OZ-organization. There is also a permanent charging station from the Zoz-ZEV-fleet right outside that you may use. For details please ask and or/see picture. 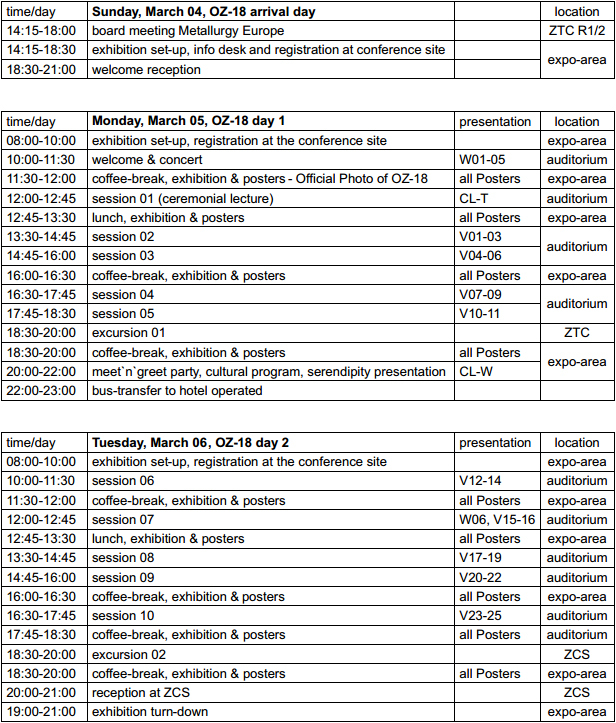 The technical excursion on Monday will start from and end at the OZ-18 venue after the technical session 05 and right before the meet`n`greet party. Please watch out for transportation info on site if needed. The technical excursion on Tuesday will start from the OZ-18 venue after the last technical session with a reception at Villa ZCS which is in walking distance from the hotel. Please watch out for transportation info on site if needed. There will be a brief stop at the hotel if requested. On Wednesday, March 7, right after OZ-18 and also at ZTC, there will be a Nanotun3D-day organized that focuses on the dissemination of a novel dispersion strengthened Ti-based PM2019 (Ti-6Al-4V-0,5dps) where the nanostructured powder composites are “pre-consolidated” by HIP and HP and subsequently atomized by EIGA to be commercialized in SLM and EBM processing. PM2019 is resulting from the ongoing Nanotun3D EU-H2020 funded undertaking (grant agreement 685952), dispersoids (dps) are Y2O3, SiC and core-shell SiC@TiO2. All OZ-18 attendees may attend, pre-registry required. Presentations, onsite processing and manufacturing will all take place at ZTC, the Zoz Technology Center, Raiffeisenstrasse 17 at Olpe. 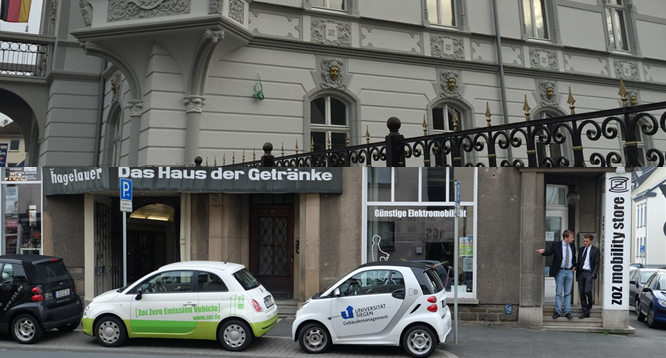 Since there is no common transportation from the conference hotel scheduled, please contact OZ-organization in case you need a lift. For the Nonotun3D-day presentations we request the same procedure as during the two session days. Insofar please check the above. Presentations will be held at ZTC at the conference room 102 or at the OG1-auditorium, both on the first floor and depending on the number of attendees.